Okay, so I'm slightly under the impression that I may have gone a bit overboard with the Harry Potter party. Between my husband's head shaking and my son's bug-eyed looks of disbelief... I've come to the conclusion that I may have just stepped a tad bit over the line of "normal". So here is where we are... get ready for a photo bomb. 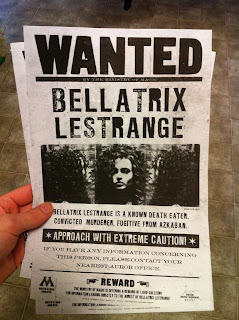 Using artwork from the online Silhouette store, I was able to print off a few "Wanted" posters. These will be stuck up all over the house. 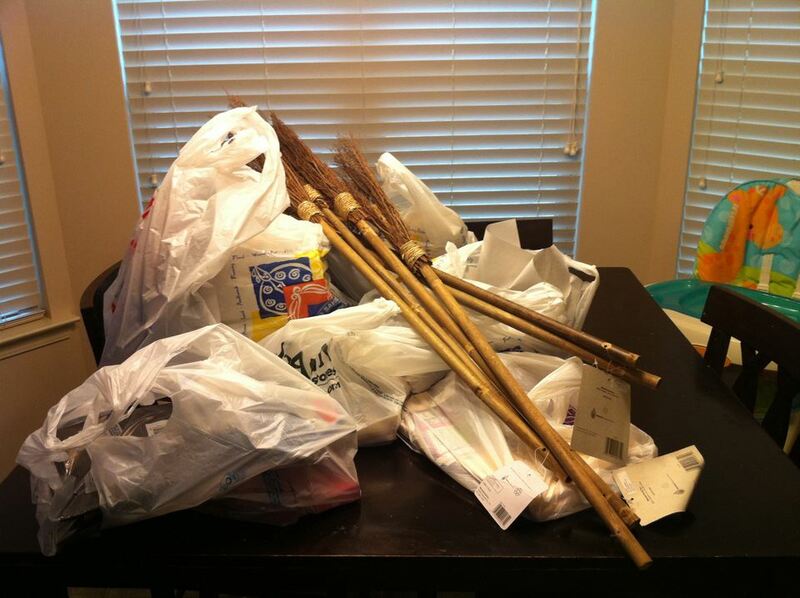 After going to a bunch of different stores, I was able to find the majority of my party supplies. Big "thank you" to the folks at Party City who didn't even bat an eye when they had to climb the gigantic ladder to get down the witch hat from the tippy top shelf. The brooms are future Nimbus 2000's. Hobby Lobby had all their glassware on sale for 50% off, so I picked up some tiny bottles with cork stoppers for the "Liquid Luck". 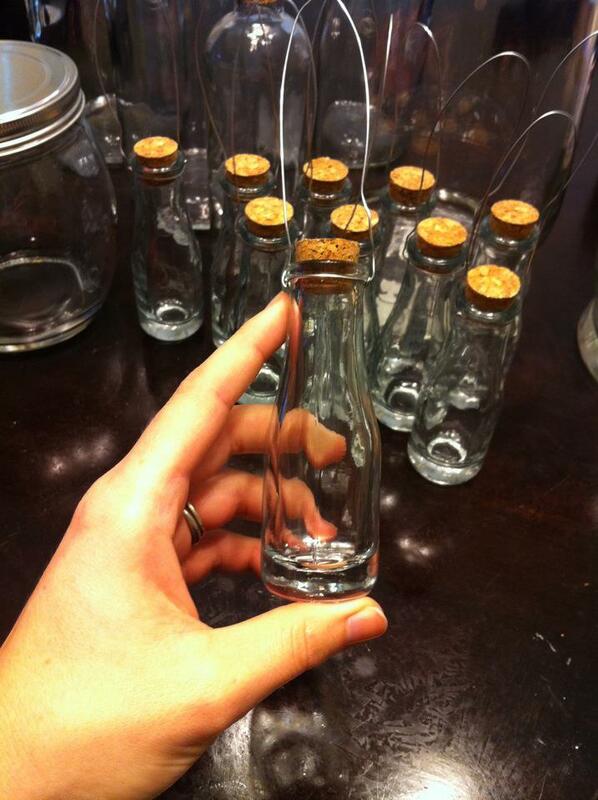 Still need to make the labels. 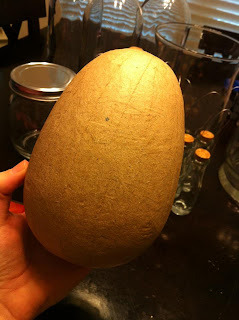 Then I found a giant paper mache egg in the wood department that will work great as Harry Potter's gold dragon egg. 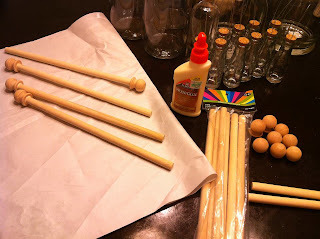 I purchased some wooden dowels and wooden "knob ends" to make magic wands. Glued them together and painted them. I thought about shaping the dowels to be more pointy, but the I remembered that I have a 2-year old and didn't want to tempt fate. 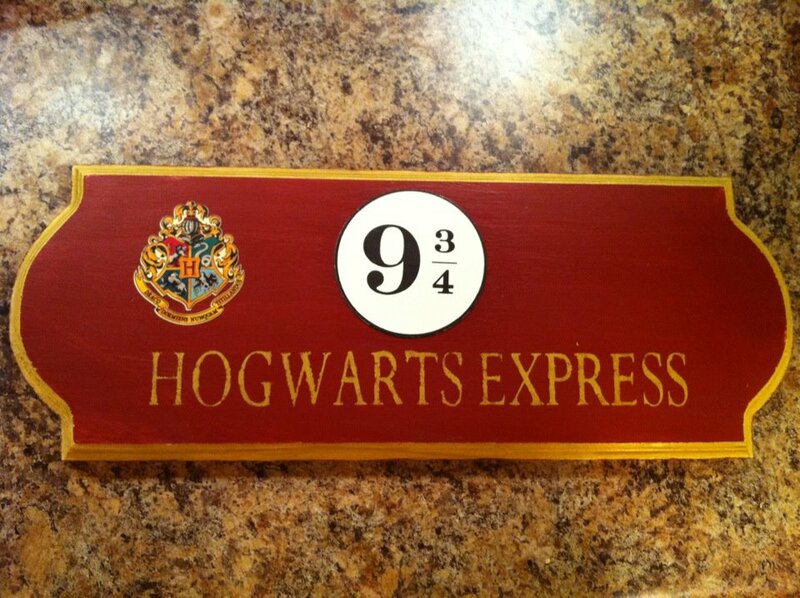 Blunt wands it is! 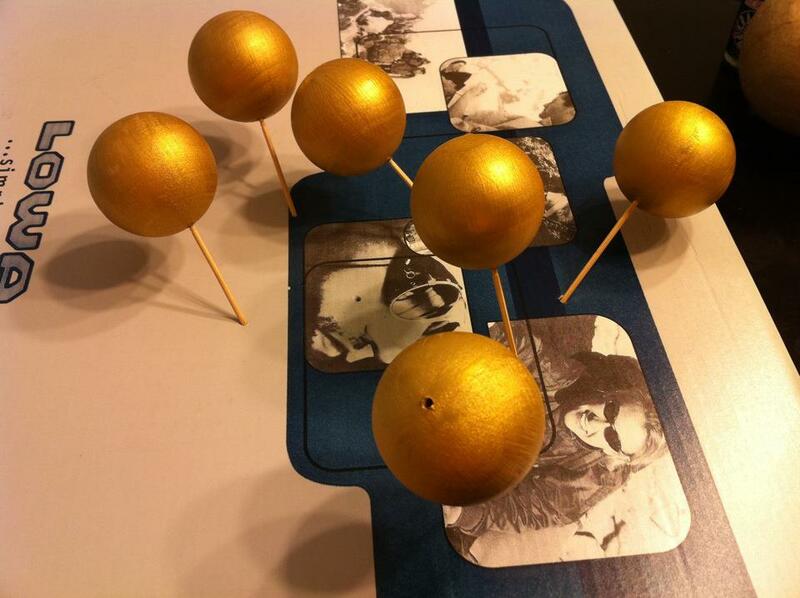 Also in the wood section, I was hunting down some wooden balls to work as snitches. All of the ones I found that were already drilled had flat planes on the drilled side. Me being the way I am, I just decided to purchase plain round ones and drill the holes myself. 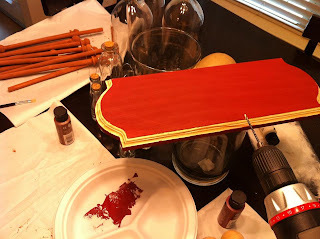 Dry on toothpicks so the paint doesn't smudge. 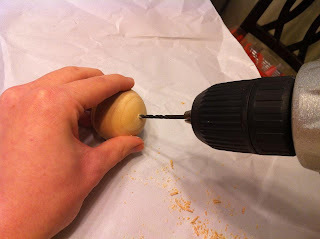 Glue feathers in holes using E6000. Feathers equal in size. ﻿Snitches Complete! 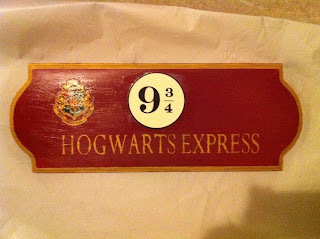 We've had horrible weather here lately, so I had to come up with an idea other than outside Quidditch. Don't want the kids getting hit by lightning! Perhaps a game of "Find the Snitch". Finally, the last thing I've been working on was the Hogwarts Express sign. This was mostly made using my Silhouette Machine. Found a piece of wood in the wood section, painted the top, side lip, and bottom a dark red color. 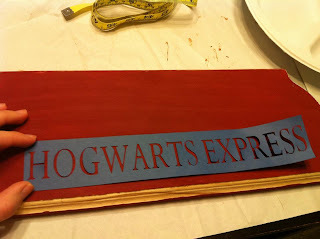 Then, I used my Silhouette Cameo to cut out the "Hogwarts Express" lettering. Then I used the Silhouette's "Print and Cut" feature to make the "9 3/4" circle and the crest. 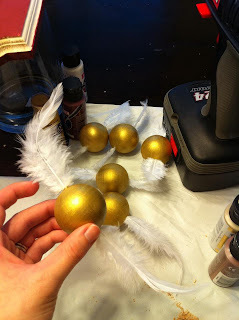 Put those on with Mod Podge, and then sealed with a clear coat of Krylon. 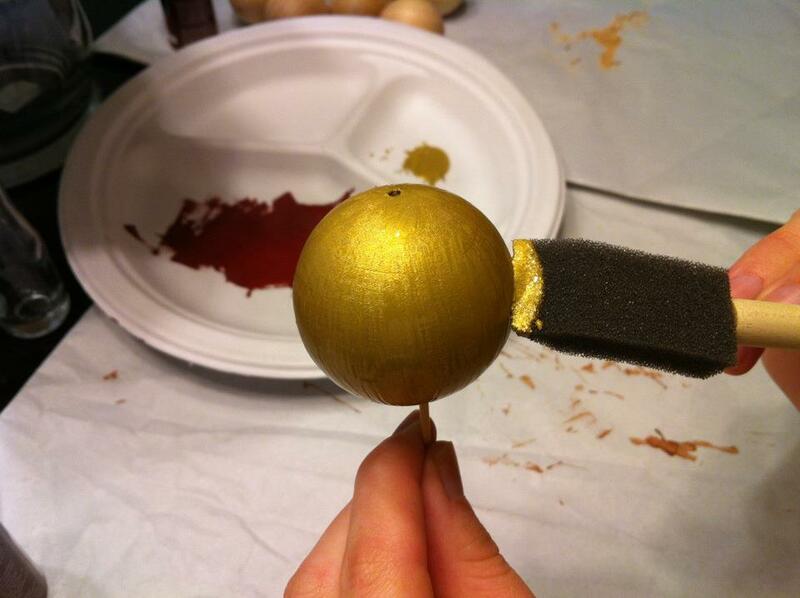 ﻿ Still have to make the potion labels, finish the golden dragon egg, and a lot more. As before, I will keep you posted and will definitely post pictures when everything is up and decorated. 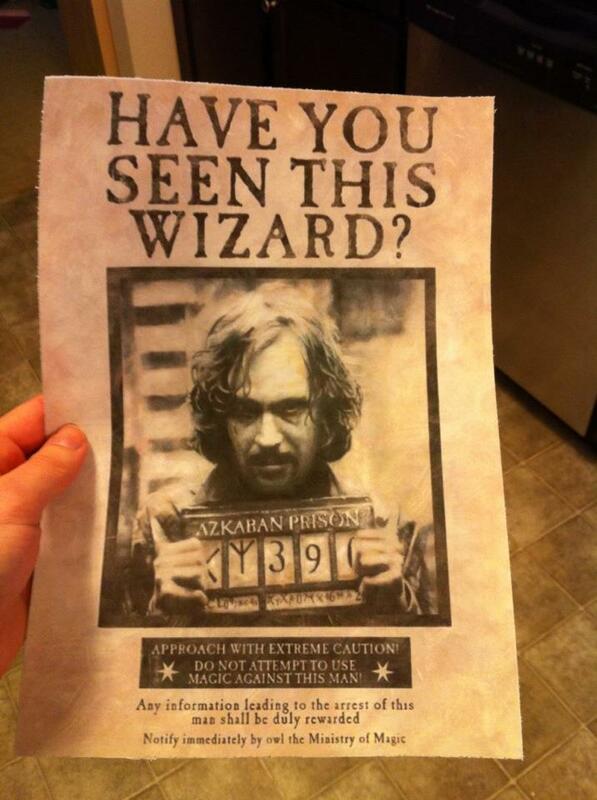 Question for you, how did you make the image for the Sirius Black wanted poster? I'm trying to print my own and coming up with images that have an annoying white background and won't work on my paper. Where exactly did you find the poster artwork on the silhouette online store? I have searched all over the silhouette site and can find nothing. 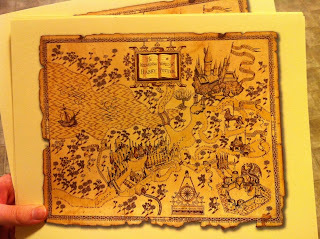 I'd also love the artwork for the posters. If you could email me them, that would be amazing! 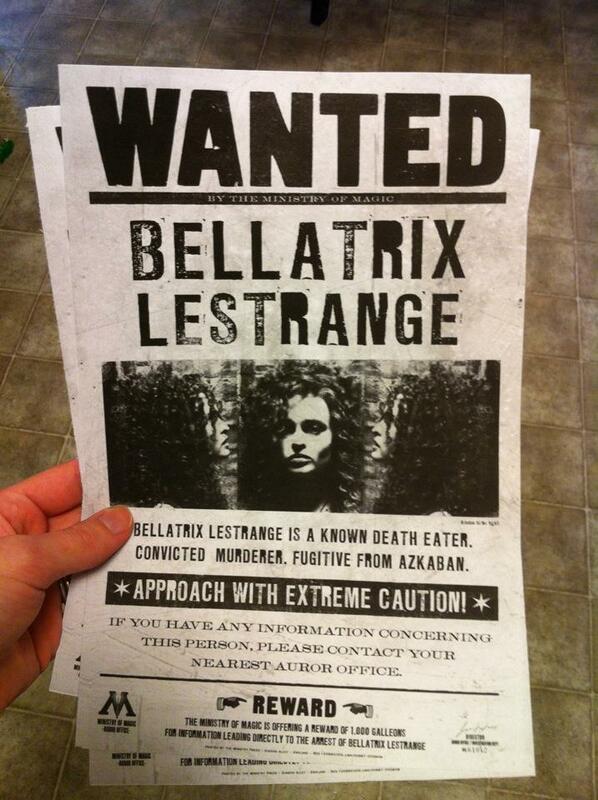 any chance you still have the files for those wanted posters? Oh how I need those posters! Love love love!! Where did you get the feathers for the snitches?? 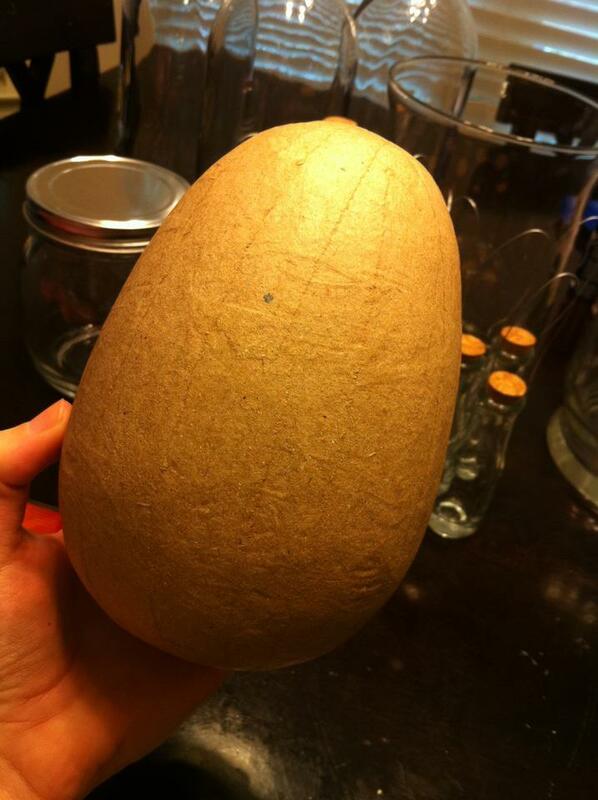 I can't find any like that anywhere! how do I get the posters for my party on monday? I love everything you did. I wish I was throwing a great party like you, but mines just going to be low key. Hi, cant find the posters on that site. Do you have a link please?